Not to be confused with Sherman County, Texas. Sherman was named after General Sidney Sherman (July 23, 1805 – August 1, 1873), a hero of the Texas Revolution. The community was designated as the county seat by the act of the Texas legislature which created Grayson County on March 17, 1846. In 1847, a post office began operation. Sherman was originally located at the center of the county, but in 1848 it was moved about 3 miles (5 km) east to its current location. By 1850, Sherman had become an incorporated town under Texas law. It had also become a stop on the Butterfield Overland Mail route through Texas. By 1852, Sherman had a population of 300. It consisted of a public square with a log court house, and several businesses, a district clerk's office, and a church along the east side of the square. During the 1850s and 1860s, Sherman continued to develop and to participate in regional politics. The first flour mill was built in 1861. Because many residents of North Texas had migrated from the Upper South and only a low percentage were slaveholders, there was considerable Unionist sentiment in the region. E. Junius Foster, the publisher of Sherman's anti-secessionist Whig newspaper, the Patriot, circulated a petition to establish North Texas as an independent free state. Following Confederate passage of a conscription law, there was resistance in North Texas to conscription, especially as large slaveholders were exempted. Slaveholders in nearby Cooke County feared that some Unionists might ally with others, and in October 1862, state militia captured and arrested 150-200 suspects from the area on suspicion of insurrection. In the Great Hanging at Gainesville, the county seat, 42 men were murdered, mostly hanged by a mob, with several men sentenced by a so-called "Citizens' Court". While the court was operating, Col. William Young had been killed by unknown assailants. He had organized the jury for the court and by the time of his death, it was already responsible for more than 20 deaths. After Foster "applauded" Young's death in his newspaper, he was murdered by Capt. Jim Young, son of the colonel. Anti-Unionist state militia rounded up more suspects in Sherman, but Confederate Brigadier General James W. Throckmorton intervened, saving all but five men who had already been lynched. During and after the Civil War, north Texas outlaw bands led by Jesse James and William Quantrill were seen in Sherman. Years later, James spent at least part of his honeymoon in Sherman, where he was photographed on horseback. Education developed in north Texas during this time. The Sherman Male and Female High School started accepting students during 1866, under the patronage of the North Texas Methodist Conference. It was one of three private schools in Sherman at the time. This school operated under several names (North Texas Female College and Conservatory of Music beginning in 1892 and Kidd-Key College and Conservatory beginning in 1919) until 1935. It gradually lost Methodist support, after the opening of Southern Methodist University in 1915 in Dallas. In 1876, Austin College, the oldest continuously operating college in Texas, relocated from Huntsville to Sherman. Sherman Female Institute, later known as Mary Nash College, opened in 1877 under sponsorship of the Baptist Church. It continued operation until 1901 when the campus was sold to Kidd-Key College. Carr–Burdette College, a women's college affiliated with the Disciples of Christ, operated there from 1894 to 1929. Jews have had a long history in Sherman, too, settling in the area and meeting for the High Holidays by 1873. While there was general depression and lawlessness during Reconstruction, Sherman remained commercially active. During the 1870s Sherman's population reached 6,000. In 1875, two fires destroyed many buildings east of the square. They were rebuilt with superior materials. This included a new Grayson County Courthouse built in 1876. In 1879, the Old Settlers' Association of North Texas formed and met near Sherman. The Old Settlers' Association of Grayson County incorporated in 1898 and completed purchase of Old Settlers' Park in 1909. On May 15, 1896, a tornado measuring F5 on the Fujita scale struck Sherman. The tornado had a damage path 400 yards (370 m) wide and 28 miles (45 km) long, killing 73 people and injuring 200. About 50 homes were destroyed, with 20 of them being completely obliterated. In 1901 the first electric "Interurban" railway in Texas, the Denison and Sherman Railway, was completed between Sherman and Denison. The Texas Traction Company completed a 65-mile (105 km) interurban between Sherman and Dallas in 1908, and it purchased the Denison and Sherman Railway in 1911. Through the connections in Dallas and Denison, it was possible to travel to the Texas destinations of Terrell, Corsicana, Waco, Fort Worth, Cleburne, and Denton, as well as to Durant, Oklahoma, by interurban railways. One popular destination on the Interurban between Sherman and Denison was Wood Lake Park, a private amusement park at the time. By 1948, all interurban rail service in Texas had been discontinued. 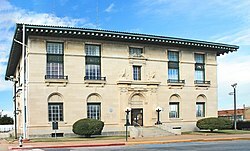 During the Sherman Riot of May 9, 1930, Sherman's elegant 1876 courthouse was burned down by arson during the trial of an African American man, George Hughes. During the riot, Hughes was locked in the vault at the courthouse and died in the fire; fire hoses were cut. After rioters retrieved Hughes' body from the vault, it was dragged behind a car, hanged, and set afire. The black business section was destroyed. Texas Ranger Frank Hamer was in Sherman during this riot and reported the situation to Texas Governor Dan Moody. Governor Moody sent National Guard troops to Sherman on May 9 and more on May 10 to control the situation. Fourteen men were later indicted. Two were convicted, of arson and rioting. As of the 2010 census, there were 38,521 people, 14,864 households, and 8,820 families residing in the city. 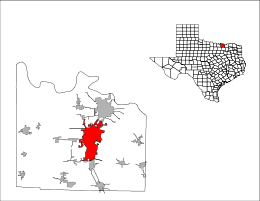 The population density was 910.0 people per square mile (351.4/km²). There were 14,926 housing units at an average density of 387.2/sq mi (149.5/km²). The racial makeup of the city was 78.6% White, 11.4% African American, 0.8% Native American, 2.1% Asian, 0.00% Pacific Islander, and 3.7% from two or more races. Hispanic or Latino of any race were 19.8% of the population. There were 14,864 households out of which 30.9% had children under the age of 18 living with them, 46.7% were married couples living together, 13.4% had a female householder with no husband present, and 35.8% were non-families. 30.4% of all households were made up of individuals and 12.5% had someone living alone who was 65 years of age or older. The average household size was 2.59 and the average family size was 3.01. In the city, the population was spread out with 25.9% under the age of 18, 13.1% from 18 to 24, 27.8% from 25 to 44, 19.3% from 45 to 64, and 13.5% who were 65 years of age or older. The median age was 34 years. For every 100 females, there were 92.1 males. For every 100 females age 18 and over, there were 89.3 males. The median income for a household in the city is $43,557. Males have a median income of $31,828 versus $23,363 for females. The per capita income for the city is $22,029. About 19.9% of the population is below the poverty line. The Texas Department of Criminal Justice (TDCJ) operates the Sherman District Parole Office in Sherman. Most children in Sherman are zoned to the Sherman Independent School District, which includes Sherman High School. Some parts are in Denison Independent School District or Howe Independent School District. A small percent of children attend one of the three private schools in Sherman. The three schools are Grayson Christian School, St. Mary's Catholic School, and Texoma Christian School. Austin College, a private, Presbyterian, liberal arts college, relocated to Sherman in 1876. Founded in 1849, it is the oldest college or university in Texas operating under its original charter. Grayson College, a community college based in neighboring Denison, operates a branch campus in Sherman. The Sherman Public Library serves the city of Sherman and all citizens. The library underwent a $2 million, floor-to-ceiling renovation in 2017, reopening to the public in August 2018. Sherman is served by two U.S. Highways: US 75 (Sam Rayburn Freeway) and US 82. (The latter is locally designated as the Buck Owens Freeway after the famous musician who was born in Sherman.) It is also served by three Texas State Highways which extend beyond Grayson County: State Highway 11, State Highway 56, and State Highway 91 (Texoma Parkway), one of the main commercial strips that connects Sherman and Denison and also extends to Lake Texoma. General aviation service is provided by Sherman Municipal Airport and North Texas Regional Airport/Perrin Field in Denison. TAPS Public Transit is the sole transit provider for Sherman, with curb-to-curb paratransit for all residents. The city of Sherman is served by Wilson N. Jones Regional Medical Center. Tyson Foods is the largest employer in the area. ^ a b "Geographic Identifiers: 2010 Demographic Profile Data (G001): Sherman city, Texas (revised 08-09-2012)". American Factfinder. U.S. Census Bureau. Retrieved March 21, 2017. ^ a b McCaslin, Richard B. "Great Hanging of Texas". Handbook of Texas Online. Texas State Historical Association. Retrieved 11 August 2013. ^ a b Nolan Thompson, "SHERMAN RIOT OF 1930," Handbook of Texas Online (https://tshaonline.org/handbook/online/articles/jcs06), accessed June 04, 2015. Uploaded on June 15, 2010. Modified on February 7, 2014. Published by the Texas State Historical Association. ^ "Population and Housing Unit Estimates". Retrieved November 20, 2018. ^ "Parole Division Region II Archived 2011-08-20 at the Wayback Machine." Texas Department of Criminal Justice. Retrieved on May 15, 2010. ^ "TAPS Public Transit". TAPS Public Transit. Retrieved 7 August 2018. Redshaw, Peggy A., "Sherman, Texas, and the 1918 Pandemic Flu," East Texas Historical Journal, 51 (Spring 2013), 67–85. Wikimedia Commons has media related to Sherman, Texas.